On June 1, 1906 Edward Stephen Harkness purchased the 35 by 115 foot vacant lot at the northeast corner of Fifth Avenue and 75th Street from John R. Ford. Lavish mansions had been filling the immediate neighborhood throughout past ten years, and Harkness would soon add one more. The empty lot, surrounded by wooden fencing and billboards in this shot around 1895, sat next to the massive Temple Beth El. photograph from the collection of the New York Public Library. Harkness was born in Cleveland, Ohio on January 22, 1874 to Stephen Vanderburgh Harkness and the former Anna M. Richardson (his second wife). Stephen Harkness had first become wealthy providing crude oil to refineries just after the Civil War. Later he organized the Euclid Avenue National Bank. But it was his investment with his stepbrother, Henry Flagler, and John D. Rockfeller in Rockefeller, Andrews & Flager that would make Harkness a vast fortune. That firm later became Standard Oil. Edward Harkness's purchase of the vacant plot had much to do with his recent marriage. In 1904, at the late age of 30, he married Mary Emma Stillman (who was about six months younger than he). The daughter of attorney Thomas Edgar and Charlott Elizabeth Stillman, she, too, had grown up amidst luxurious surroundings. On June 22, 1907, The New York Times announced that “Plans have been filed for the new five-story residence to be built by Edward S. Harkness at the northeast corner of Fifth Avenue and Seventy-fifth Street…The house will cost $250,000 according to the estimate of Architects Hale and Rogers.” (The cost would be more in the neighborhood of $6.73 million today). The lot bore an impressive Fifth Avenue address. But Rogers designed the Italian Renaissance palazzo to face 75th Street. By turning the structure to the side, he precluded the problem of a long, dark and narrow house. But it caused a different problem for Harkness. Three years earlier Stuart Duncan had erected his own handsome mansion next door--at No. 1 East 75th Street. His architect, C. P. H. Gilbert, incorporated the address in the keystone above the door. But now Edward Harkness wanted that address. It may have been his reserved personality that resisted the ostentatious Fifth Avenue number; or it may have been that he struggled with the logic of what was truly a 75th Street house bearing an avenue address. Whatever the case, he demanded the address of No. 1 and got it. Duncan had to have the bronze lettering "No 3" affixed to his keystone. It is commonly repeated that Stephen's mother, Anna, paid for the residence as a wedding present. The timing, three years after the ceremony, brings that into question. It is feasible that the house was merely a gift. The serene Renaissance palace was faced in Tennessee marble. Pretending to contain four stories, there were actually seven--two below ground and another hidden behind the stone balustrade above the cornice. A light moat was protected by a magnificent cast and wrought iron fence, modeled after the Scalegari tombs of Verona. Socially reserved, the Harknesses disdained ostentation and the waste of money (Edward often said "A dollar misspent is a dollar lost.") The couple would prefer to give money to deserving causes than to spend it on pretentious entertainments. There was, for example, no ballroom in the new mansion. And Rogers ensured their privacy by raising the street floor openings just above eye level. On one of the subterranean floors he design an innovative refrigerated room. When temperatures outside fell an exterior door could be opened and the electricity to the room turned off, allowing nature to cool the space--another means of preventing "misspend" dollars. None of this meant that the Harknesses would live like monks. 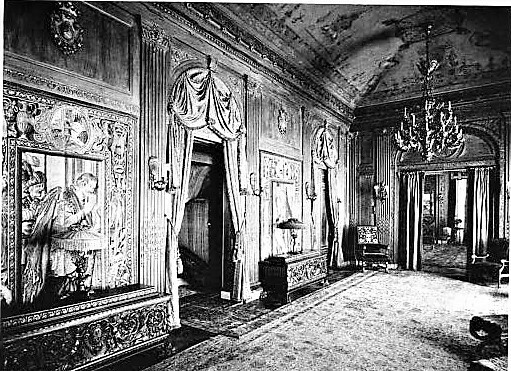 The sumptuous interiors drew from several styles. The Louis XVI reception room had a frescoed ceiling, intricately carved walnut woodwork and crystal chandeliers. 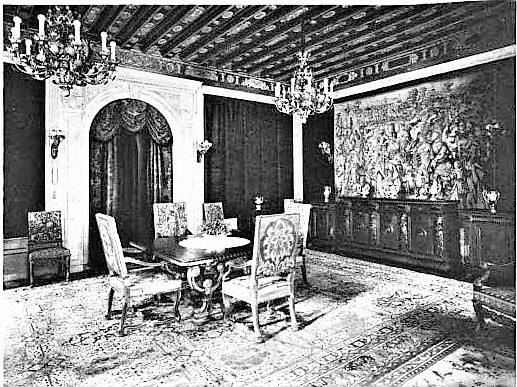 The Italian Renaissance dining room, at the opposite end of the ground floor, featured a stenciled, beamed ceiling with gilt plaster of paris ornaments that imitated metal. Two windows on the east wall would look out onto the side wall of the Duncan house. 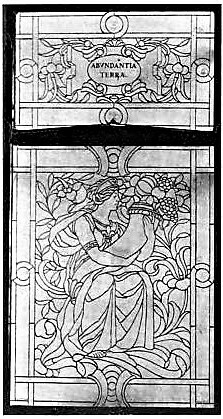 So artisan Kenyon Cox fashioned them of opaque glass which allowed light into the room but masked the unsightly view. He told the Architectural Record in 1909 "while I have spoken of leaded glass, the windows are actually put together with copper...and by backing the whole with plate glass, it was found possible to make them perfectly rigid without recourse to supporting bars." They depicted the allegories of "Abundantia Maris" and "Abundantia Terrae"--the abundance of sea and of land. 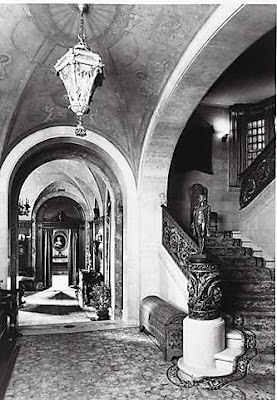 Rogers had originally designed a grand entrance hall, so arriving visitors would be met with a view of the bronze-railed staircase and polished limestone walls that resembled marble. The Harknesses balked at the perceived pretentiousness and Rogers reworked the plans, resulting in an unusual configuration. The entrance doors opened into a small vestibule. Here visitors would turn left into an entrance room. The staircase was essentially hidden behind the vestibule and only when guests moved from the reception room to the dining room would it become visible. The ceiling of the staircase hall was a false skylight of trellises and vines, lit from behind. The second floor contained just three rooms--rarely seen by visitors. 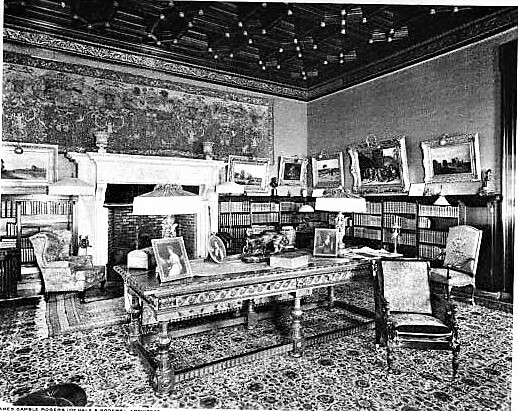 Off the central "gallery" were the library, which double as Harkness's office, and the music room. The Architectural Record called the gallery "perhaps the most beautiful room in the house." A Carrara marble fountain with a bronze figure of Pan sat below a vaulted ceiling of Greek and Pompeiian motifs and gilded bronze chandeliers. The library was paneled in richly veined Brazilian rosewood. Rogers bathed the room in gentle light by installing dozens of electric sockets in the beams of the Italian Renaissance ceiling to accommodate small light bulbs. At the other end of the gallery, the Venetian music room was sumptuous, with a carved ceiling that included painted canvas insets. 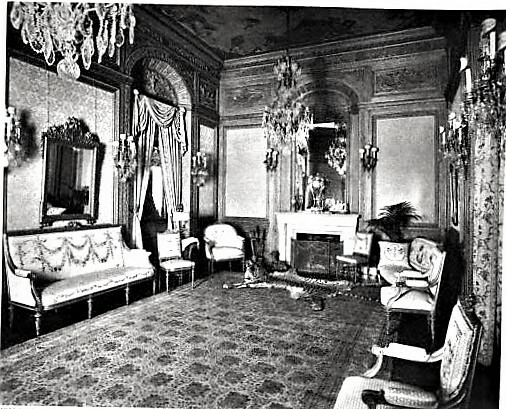 For an unknown reason, the music room was renovated in 1920. Much architectural detail was eliminated, including the painted inserts on the elaborate ceiling. The third floor contained Mary's and Stephen's private rooms. 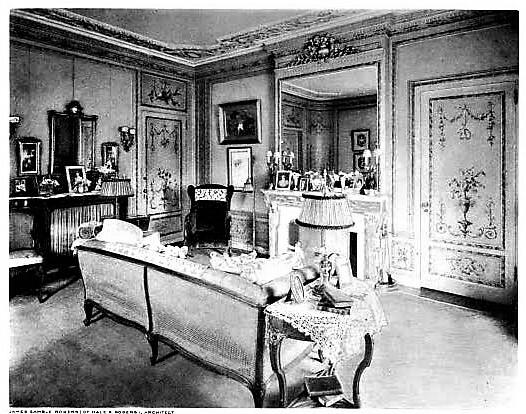 Mary's pretty boudoir was decorated in the French style. Their bedroom faced 75th Street (although in a few years Stephen had remodeling done to create his own bedroom on the eastern end of the floor). There were five guest bedrooms on the fourth floor, along with a room for a valet. The main staircase ended at this level and access to the top floor was by a service staircase. Here were rooms for eight female servants (the original census lists them as all Swedish) and the laundry. 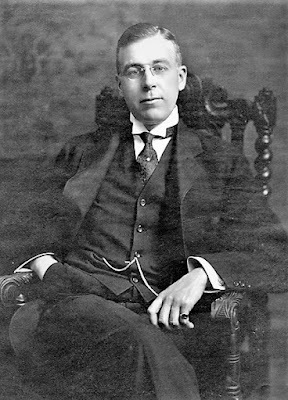 Although Harkness briefly served as a director for the Southern Pacific Railroad, he soon turned his attention to full-time philanthropy. And he was well-equipped to do so. He already had a massive fortune when, on May 9, 1916, The New York Times reported that he had inherited "all of the stock in the Standard Oil Company" held by his brother, Charles W. Harkness, who died on May 1 that year. This, said the newspaper, made him "the third largest holder of Standard Oil stock in the world." The bequest was worth about $60 million at the time. Within two years Forbes magazine deemed him the sixth-wealthiest person in the United States. Harkness, who felt it was "imperative for the wealthy to give back to society through generous benefactions," was no doubt significantly influenced by his mother. Anna Harkness was highly involved in numerous charities. 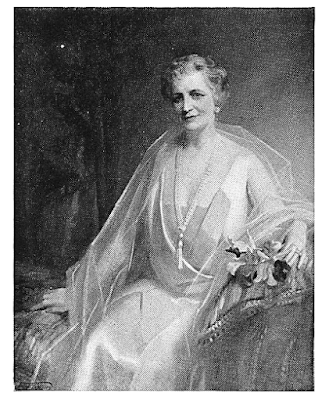 With an initial gift of $10 million she founded the Commonwealth Fund in 1918. Its broad intention was to "enhance the common good." Naming her son president, she stressed the importance of providing health care to low-income families, minority groups, children and the elderly. Edward would devote much of his time, money and energy to the Commonwealth Fund. But his and Mary's philanthropy seemed to know no bounds. And their interest in Egyptian archaeology proved a boon to both explorers and museums. 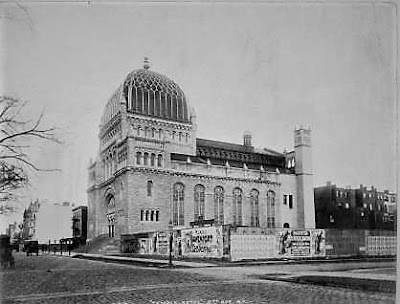 On January 30, 1916 The Times reported that the 4,500-year-old "tomb of Perneb is now in the Metropolitan Museum of Art in this city, a magnificent addition to its Egyptian department. It was presented to the museum by Edward S. Harkness." 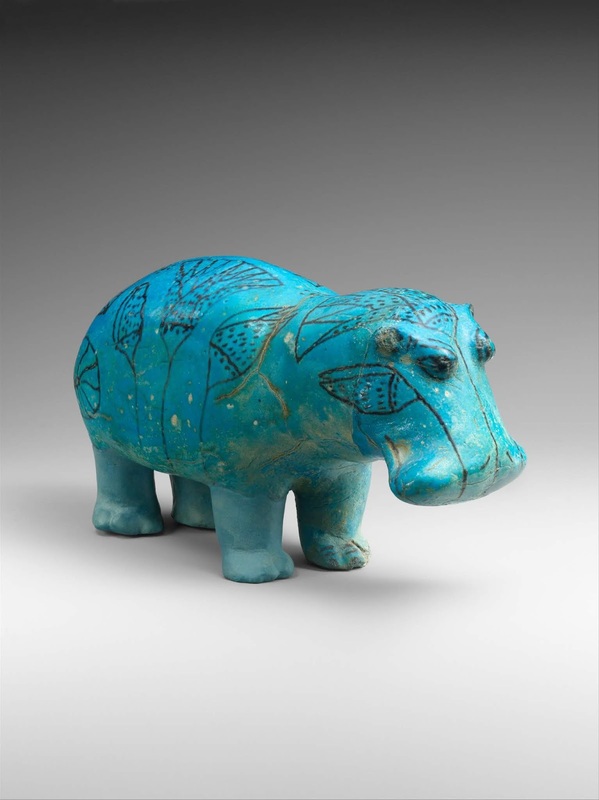 And the following year the newspaper reported "A small blue hippopotamus, of Egyptian faiece, is the special treasure in the collection of recent accession of the Metropolitan Museum of Art...The little animal is a gift of Edward S. Harkness, one of the trustees of the museum, and dates back to 1950 B.C." The relic, which earned the name William, has become an icon of the museum's Egyptian collection. Edward and Mary helped finance Howard Carter's second excavation season of the tomb of Tutankhamen in the winter of 1923-24. Among the privileged few who saw the dazzling pharaoh's tomb were the Harknesses. Archaeologist Arthur Cutenden Mace kept a detailed journal which noted on December 12, "Harknesses arrived." They visited the tomb the following day. His entry on December 14 included "Mrs. Harkness, Mrs. Lythgoe & Miss Stilman [sic] over in Valley [of the Kings]." The Harkness name appeared in newspapers for their generous donations and funding--almost never for social activities. While they did host luncheons and dinners, the low-profile couple did not notify the press, as most socialites did. And when society columnists did get wind of an event, the coverage was minimal. A one-line report in The New-York Tribune on July 3, 1922, for instance, was frustratingly bare-bones for society watchers. "Mr. and Mrs. Edward S. Karness entertained at a luncheon at their summer home this afternoon." That residence was their 186-acre estate "Weekend" on Long Island, designed by John Gamble Rogers. They also maintained a 230-acred estate, "Eolia," in Waterford, Connecticut overlooking the Long Island Sound; houses in North Carolina and California and a "camp" in the Adirondack Mountains. Throughout the decades the Harkness philanthropy continued unbridled. In 1928 Harkness paid $10 million for eight residential buildings for Harvard College, completed in 1931. In 1930 he donated $11 million to Yale for nine residential colleges, with James Gamble Rogers as architect. Edward died on January 30, 1940 at the age of 66. His body was placed in the Harkness Mausoleum in Woodlawn Cemetery in the Bronx. Designed, as expected, by James Gamble Rogers, it was completed in 1924. Reflective of the Harknesses' disdain for self-promotion or ostentation, their names appear nowhere on the structure. Edward's will directed that his estate would go to charitable and educational institutions upon the death of his wife. Mary Harkness died on June 7, 1950 in the white marble palazzo that had been her home for 43 years. The Harkness fortune of $60 million was distributed to charities. The collection of art masterpieces were bequeathed to the Metropolitan Museum of Art, including works such as a portrait by Sir Thomas Lawrence, Constable’s Salisbury Cathedral, and Hans Holbein the Younger’s Portrait of a Member of the Wedigh Family. 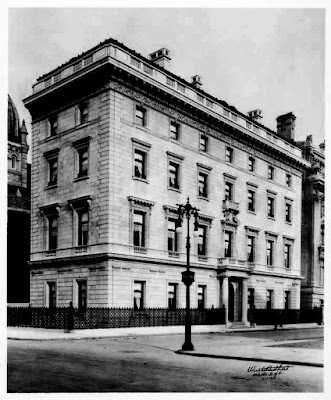 The 75th Street mansion was donated to The Commonwealth Fund, which occupies it today. As few changes as possible have been made to the interiors to accommodate administrative offices. Much of that preservation is credited by current director curator Paul Engel to former president John E. Craig, Jr. who was coincidentally born in a Harkness hospital. Gorgeous interior photos. So glad so much has been preserved. I have an exact copy of that blue faience hippo sitting on my desk. It was a gift, and I never knew anything about it, so it was a nice surprise seeing that picture and explanation.